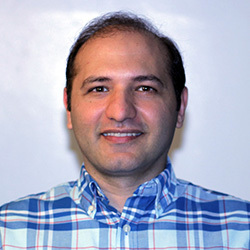 We are pleased to announce that the Water Resources Research Center’s Dr. Sayed Bateni has received a major award from the US Department of Agriculture’s Conservation Innovation Grants program. Dr. Bateni has been a researcher with WRRC since 2014 and focuses on Earth Remote Sensing, Land-Atmosphere Interaction, Data Assimilation: Techniques, Development and Applications, Optimization Techniques and Parameter Estimation in Hydrology, and Application of Artificial Intelligence Methods. He holds a joint appointment with the Department of Civil & Environmental Engineering at UH. Dr. Bateni will be the principal investigator of “Real-time Optimization of Irrigation Scheduling for Farmlands in Hawaii, Guam, and American Samoa”. The $980,000 grant over three years proposes to demonstrate optimal irrigation management strategies. Dr. Bateni’s partners include CTAHR and WRRC from the UH campus as well as collaborators from the University of Guam and the American Samoa Community College. Water is by far the major constraint to crop production in most regions of Hawaii and Guam and some parts of American Samoa. Even areas with abundant rainfall experience a high seasonal variability that does not maintain adequate water for vegetable crops throughout the year. High temperature and evapotranspiration rates, in combination with limited water storage capacity of soil, reduce water availability for crops. Additionally, the limited supply of water in the Pacific Islands is subject to ever-increasing demands. Growing demands on the allocation of limited fresh water resources and potential decreases in precipitation at the local scale make it imperative that farmers acquire the ability to match irrigation application with crop water needs (the so-called optimal irrigation scheduling) to increase water use efficiency and improve water conservation. Optimizing irrigation quantity is also the first concern for growers in the Pacific Islands due to the high cost of water, pumping energy, and increasingly variable and unpredictable precipitation patterns. This is particularly important because Hawaii and other Pacific Islands have placed a high priority on increasing sustainable local food production, which would put more stress on water resources. Despite the limited water resources as well as the high cost of water and energy in the Pacific Islands, growers irrigate their farmlands based on observation, past experience and perceived crop water requirements without considering key components of the water balance equation, especially soil water content and evapotranspiration (ET). The visual observation approach lacks precision and accuracy, and can lead to over- or under-irrigation. Insufficient irrigation results in reduced yields whereas over-irrigation increases the susceptibility of the crop to diseases, water waste, inefficient use of nutrients, and environmental contamination due to leaching of fertilizers (Andales et al., 2014). In addition, over-watering unnecessarily increases farmer’s cost of water and pumping energy (Pardossi and Incrocci, 2011). To overcome the abovementioned problems, this project aims at optimal irrigation scheduling in the farmlands of Hawaii, Guam, and American Samoa. Irrigation scheduling involves deciding how much water to apply to a field and at what time. It significantly affects the agronomy and economy of farms and is critical to water use efficiency, crop health, and environmental quality. Optimal scheduling strives to apply water in the right amount and at the right time in order to conserve water resources and energy, improve crop yields, and reduce negative environmental impacts. It offers several advantages: 1) it lowers farmers’ cost of water and labor through fewer irrigation events, 2) it allows farmers to schedule watering to minimize crop water stress and maximize yields, 3) it reduces fertilizer costs by minimizing deep percolation (leaching), and 4) it increases farmers’ profit by enhancing crop yields and quality. This project directly addresses four of the NRCS national priorities by: 1) benefiting historically underserved producers through engagement and outreach, 2) conserving ground and surface water resources, 3) reducing groundwater contamination, and 4) improving efficiency of water us. It also addresses two of the NRCS Pacific Islands Area priorities: 1) the inefficient use of irrigation water and 2) nutrient contamination of ground or surface waters (http://www.nrcs.usda.gov/wps/portal/nrcs/detail/pia/programs/financial/eqip/?cid=nrcs142p2_0 37373). Hence, there is an urgent need to develop a decision making tool that can help farmers in tropical islands towards the efficient use of water resources. Smart irrigation scheduling is a priority of growers in Hawaii, Guam, and American Samoa. Farmers in the region have requested research and extension personnel to develop a water irrigation scheduling tool and practices that assist them save water and energy. A wide range of tools and decision support systems have been developed to assist growers make site-specific water management decisions (Jones, 2004; Vellidis et al., 2008; Fernandez and Cuevas, 2010; Dabach et al., 2013; Bateni et al., 2014; Hunsaker et al., 2015). Complex systems such as Decision Support System for Agrotechnology Transfer (DSSAT), exist, but due to their complexity and cumbersome data requirements, use has been limited to research rather than as a practical tool for commercial growers. Recently, the University of California Cooperative Extension developed CropManage (https://ucanr.org/cropmanage) for the temperate and semi-arid climate of California. CropManage is an online database-driven tool that assists growers and farm managers determine water applications on a field-by-field basis (Cahn et al., 2013). The software utilizes weather-based irrigation scheduling to guide grower management of water. A rising number of commercial vegetable growers in California’s Central Coast have begun to use this web-based tool to better manage scarce water resources. In fact, farmers in California can easily and inexpensively use the CropManage software via their computers and smart phones. Unfortunately, this tool cannot be directly transferred to tropical islands as the soils and climate of California are very different from the soils and climate of tropical Pacific islands like Hawaii, Guam and American Samoa. Moreover, crop-specific data developed in California cannot be used in tropical island environments, and must be measured on site. The novelty of this project is to develop a viable online irrigation tool for crops, soil types, and climates of tropical islands, and assist farmers to adopt it. A multidisciplinary team from the University of Hawaii (UH), University of Guam (UOG), and American Samoa Community College (ASCC) will collaborate with Dr. Michael Cahn, the developer of CropManage, to build an online smart irrigation scheduling tool for the vegetable crops in Hawaii. To extend this tool to a wider geographical region, we are collaborating with professors, extension agents, and growers from Guam and American Samoa. These regions are geographically isolated and have limited tools and resources to manage water. Inhabitants of these islands are historically underserved Native Pacific Islanders. Moreover, these islands are under the increasing threat of water scarcity due to climate change, and they are challenged by the high cost of water and energy. As the Pacific Island populations continue to grow and develop, water resources for crops will become more and more restricted. The overall goals of this project are: 1) to improve water use efficiency through the development of a web-based smart irrigation scheduling tool for farmlands in Hawaii, Guam, and American Samoa, and 2) to increase grower awareness and adoption of irrigation management strategies that maintain profitable crop yield and quality without detrimental effects on water supply. Smart irrigation scheduling refers to technologies that can help farmers determine more precisely when crops need to be watered and how much water they require. A tool to address this issue was developed for California with high success rate ( https://cropmanage.ucanr.edu). We are expanding on this proven technology and will modify the tool for tropical climates, crops, and soil types. The application of this tool will assist farmers to decrease production expenses by using less water, energy, labor, and fertilizer, and to minimize adverse water quality effects of crop production on ground and surface water supplies. Specific objectives are: 1) developing a user friendly web-based irrigation scheduling tool by modifying the CropManage to suit the Pacific Islands’ crops, soil types, and climate, 2) evaluating the use of weather-based irrigation scheduling to improve water use efficiency for selected high value vegetable crops, and 3) implementing an outreach program to increase farmers awareness and adoption of improved water management strategies. With smart irrigation scheduling, farmers will be able to irrigate more efficiently, by reducing the amount of applied water, while maintaining or even improving yields. By the end of this project, farmers will be able to schedule the irrigation water supply according to the water needs of the crops. Through the design of a user friendly, web-based scheduling tool, farmers will be able to find the relevant information about the irrigation scheduling on the web site of the Water Resource Research Center (WRRC) at the University of Hawaii (http://www.wrrc.hawaii.edu/index.shtml). The results of this project will significantly favor irrigators since the information can be delivered electronically to farmers and eliminates much of the labor involved in measuring soil water through soil sampling. Andales, A. A., Bauder, T. A., and Arabi, M. (2014), A mobile irrigation water management system using a collaborative GIS and weather station networks. In: Ahuja, L. R., Ma, L., Lascano, R., Applications of Agricultural System Models to Optimize the Use of Limited Water, ISBN: 978-0-89118-344-0. Pardossi, A., and Incrocci, L. (2011), Traditional and new approaches to irrigation scheduling in vegetable crops, HortTechnology, 21(3), 309-313. Jones, H. G. (2004), Irrigation scheduling: Advantages and pitfall of plant-based methods, Journal of Experimental Botany, 55, 2427-2436. Vellidis, G., Tucker, M., Perry, C., Kvien, C., and Bednarz, C. (2008), A real-time wireless smart sensor array for scheduling irrigation, Computers and Electronics in Agriculture, 61(1), 44- 50. Fernandez, J. E., and Cuevas, M. V. (2010), Irrigation scheduling from stem diameter variations: A review, Agricultural and Forest Meteorology, 150(2), 135-151. Dabach, S., Lazarovitch, N., Simunek, J., and Shani, U. (2013), Numerical investigation of irrigation scheduling based on soil water status, Irrigation Science, 31(1), 27-36. Bateni, S. M., Entekhabi, D., Margulis, S., Castelli, F., and Kergoat, L. (2014), Coupled estimation of surface heat fluxes and vegetation dynamics from remotely sensed land surface temperature and fraction of photosynthetically active radiation, Water Resources Research, 50(11), 8420-8440. Hunsaker, D. J., French, A. N., Wallerm P. M., Bautista, E., Thorp, K. P., Bronson, K. F., and Andrade-Sanchez, P. (2015), Comparison of traditional and ET-based irrigation scheduling of surface-irrigated cotton in the arid southwestern USA, Agricultural Water Management, 159, 209-224. Cahn, M., Smith, R., and Hartz, T. K. (2013), CropManage: A web-based irrigation and nitrogen management tool, 2013 California Plant and Soil Conference Visalia, CA, 90-95.